The forecast does not look good for trick or treating on Halloween night this year, folks. I mean, 50% chance of rain or even SNOW? After last year’s Halloween night deluge, I feel the Weather owes us this time around. 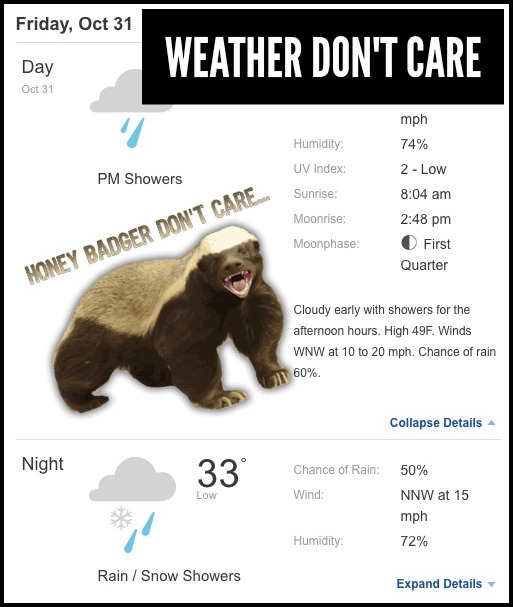 But apparently, like Honey Badger, the Weather don’t care. Head to the Fountain for some balloon-twisting fun with Twisted Ideas Balloons from 4 to 7 p.m. For ages 12 and under, check in at the Tri-County Mall Customer Service desk for treats and a list of participating stores in the mall. Then trick or treat throughout the mall from 5 to 8 p.m. The Boone County Public Library opened their doors last year to trick or treaters because of the rain, and much to their surprise, more than 3,000 kids and parents showed up. 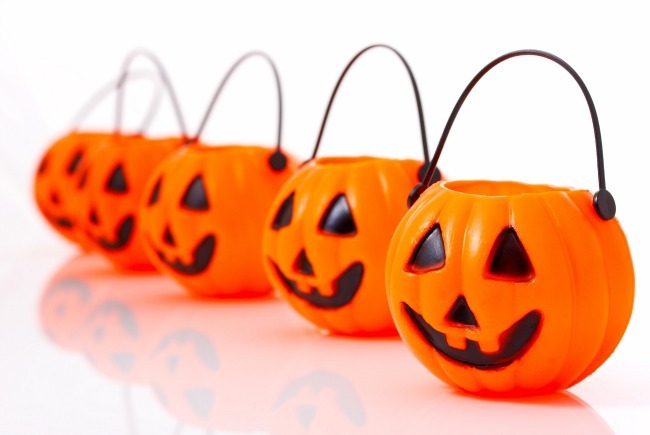 So by popular demand, three library locations (Main Library, Scheben Branch and Florence Branch) will once again be open for trick or treating from 6 to 8 p.m. The library will give away bookmarks, pencils and Tales tattoos. Parents can bring the candy and kids (the library provides tables where you can hand out candy). Choose a spot and wait for the trick or treaters to arrive. From 5 to 7 p.m., participating retailers throughout Eastgate Mall will offer special treats to little ghouls and goblins in a fun environment. All children (up to age 12) must be in costume and accompanied by an adult. Adults are asked not to wear masks. Florence Mall will host trick or treating at participating retailers for children ages 12 and under beginning at 6 p.m. Trick or treating ends at 7:30 pm. Calling all ghosts, goblins, princesses and superheroes! Come to Northgate Mall in your best spooktacular costume and trick or treat. Participating stores will be handing out candy from 5 to 7 p.m. during this Halloween event. Stop by the Bass Pro Shops store at Cincinnati Mills from 4 to 8 p.m. with your trick-or-treaters. They can get a free 4×6 photo, decorate a real pumpkin (also free), get free glow in the dark glasses (first 100 kids to attend), and trick or treat in designated departments throughout the store. Also, at 6 p.m., join the costume parade and contest (the winner gets a $10 Bass Pro Shops Gift Card). 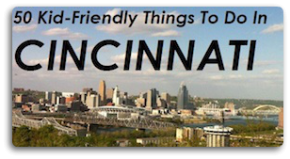 Did we miss any local indoor trick or treating events? Please share them in the comments. I believe Ikea in West Chester is also doing it from 6-8pm tonight (Oct 31).